Poha / flattened rice/ Aval / Beaten Rice is nutritious food for babies that can be given to babies from 7 months after introducing basic veg and fruit purees, rice and dal. 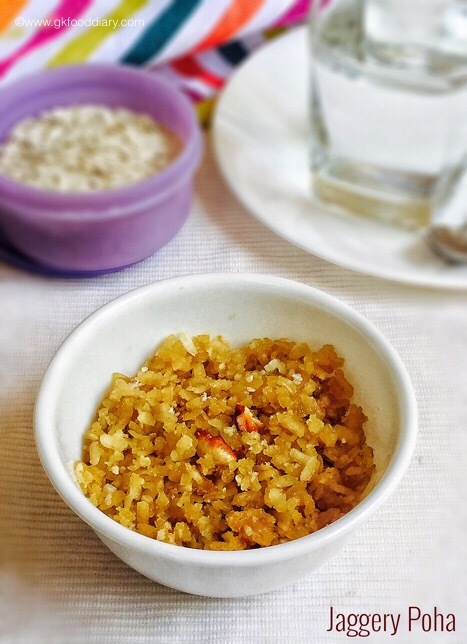 Poha requires no cooking hence it is one of the quickest food to cook and this Poha jaggery recipe is no exception. My mom makes this jaggery poha at least once a week, I remember having this when I returned back from school. It tastes delicious and yum, will sure to be a winner among kids. Poha is rich in iron, hence prevents baby from iron deficiency or anemia. Loaded with carbs and considered as a wholesome meal option for babies. Low in gluten and hence less likely to develop a food allergy. 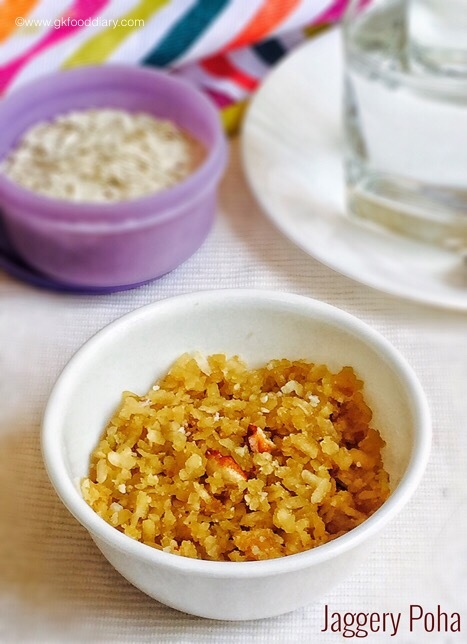 Here is how to make easy jaggery poha for babies & toddlers. 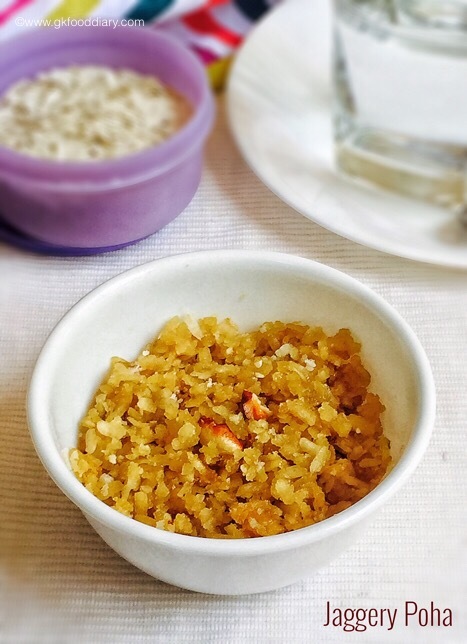 Jaggery Poha - Poha/flattened rice cooked with jaggery. It can be served as a breakfast or snack for babies & kids. Measure jaggery and poha. Keep it ready. Rinse poha and soak it in water for 5 minutes or until it becomes soft. Soaking time depends on the poha variety. 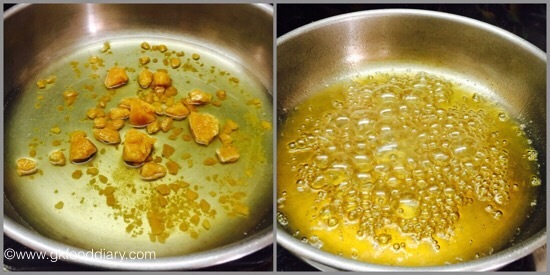 Add jaggery in a pan and add water till it immersed level. Heat a pan and melt it. Switch off the flame once bubbles start to appear and jaggery syrup is little thick. Strain the jaggery water through a strainer in order to remove impurities. Now in the same pan add jaggery syrup along with soaked poha. 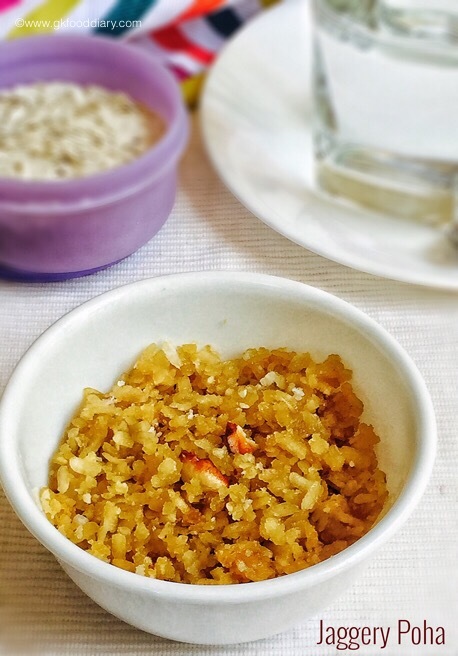 Mix the poha well with jaggery until it's coated evenly. 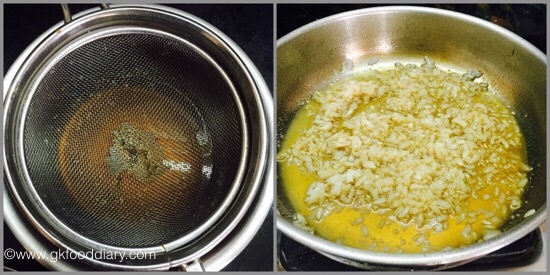 Now add grated coconut, ghee fried cashews (if using). Give a quick stir and switch off the flame. 1. Measure jaggery and poha. Keep it ready. 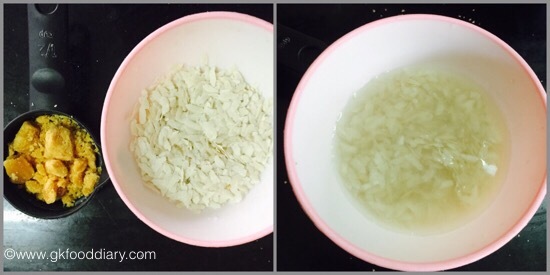 Rinse poha and soak it in water for 5 minutes or until it becomes soft. Soaking time depends on the poha variety. 2. Add jaggery in a pan and add water till it immersed level. Heat a pan and melt it. Switch off the flame once bubbles start to appear and jaggery syrup is little thick. 3. Strain the jaggery water through a strainer in order to remove impurities. Now in the same pan add jaggery syrup along with soaked poha. 4. 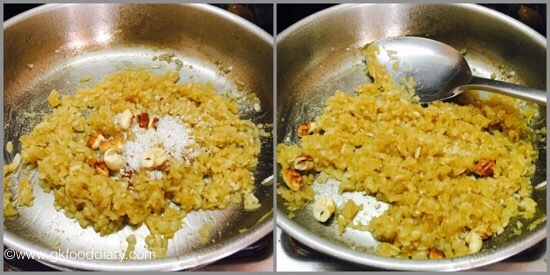 Mix the poha well with jaggery until it’s coated evenly. Now add grated coconut, ghee fried cashews (if using). Give a quick stir and switch off the flame. Top it with ghee and serve the poha jaggery warm. Tastes yum! Soaking time depends on the poha variety used. I used thick poha and soaked for 5 minutes. Too much soaking makes the poha mushy and less soaking makes it hard to chew. For small babies, skip coconut and nuts. I used white poha. Red poha has more nutrients than white hence it’s highly recommended. Generally, poha doesn’t cause any allergies, but check for symptoms and stop feeding your baby if you find any. Jaggery can be replaced with sugar, palm jaggery, palm sugar for babies above one year. 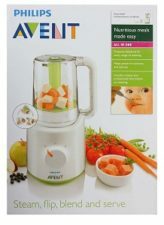 For babies below one year, you can try with mashed banana. Hi kalyani mam its a nice snacks n a small doubt can I use red aval wit d same method..
Hi mam.. can we give this when kids have cold? my son is 1.5 years. You should avoid any sweet items during cold. Otherwise you can give this as a snack, perfect for this winter. Hello mam….What can be used as a substitute to jaggery?